With over 80 collegiate institutions in Alabama, selecting the ideal path to pursue your higher education can seem intimidating. Prospective students need to choose between a two-year or four-year degree while also considering a multitude of factors, such as preferred field of study, tuition cost and scholarship availability. To facilitate your college search, we compiled a ranking of Alabama's top colleges based on a variety of metrics and up-to-date data. Alabama contains a diverse set of educational opportunities, with four-year colleges filling a variety of needs for the state's 4.8 million residents. And while there are plenty of opportunities for higher education in Alabama, the state's demographics don't necessarily reflect that. According to the most recent census data, only 29.8% of Alabama's residents age 25 and up have a bachelor's degree, versus a 28.8% national average. This gap means there are plenty of potential job openings for skilled and educated workers, and Alabama's Board of Education is taking steps to make college a realizable opportunity for residents. With government assistance programs such as the 529 Fund and Plan 2020 providing tuition grants and increased scholastic funding, Alabama hopes to increase the number of college educated workers in the job market and to make the state more attractive for potential job creating businesses. You can take advantage of these programs by starting with this list of the best four-year universities in Alabama. Alabama’s first public university, the state’s flagship college, was founded in 1831. Located in Tuscaloosa, UA is home to over 37,000 students and over 500 student organizations, sports clubs, and recreational activities. UA is one of the best colleges in Alabama. The school teaches students how to think critically and make intellectual contributions through the research process. At Alabama, students have access to over 80 undergraduate programs provided through 12 colleges and schools. Fields include the sciences, engineering, arts, and culture. Students interested in the arts and sciences have degree options in fields like African American studies, music, theater, philosophy, chemistry, psychology, and criminal justice. The Culverhouse College of Commerce offers majors in information systems, accounting, management, marketing, and more. Famous alumni include retired football running back Shaun Alexander, retired basketball player Latrell Sprewell, and Wikipedia co-founder Jimmy Wales. Alabama-Birmingham focuses on innovation and student success, and is considered one of the best colleges in Alabama. The university provides activities and sports for students, which include over 20 clubs and intramural sports, more than 180 organizations, Greek life, and 18 Division 1 NCAA sports teams. Alabama-Birmingham has a diverse student population of over 11,0000, many of whom are veterans. The institution offers several scholarship opportunities and resources exclusively for its veteran students. Through its eight colleges, UAB offers bachelor’s degrees in business, education, arts, public health, and more. With over 120 programs to choose from, students can find a degree plan for just about any interest. Popular options include nursing, information systems, business management, marketing, and psychology. Famous alumni include wide receiver Roddy White, biochemist Lawrence J. DeLucas, and Surgeon General Regina Benjamin. The University of Alabama in Huntsville (UAH) is a public Tier 1 national university located in Huntsville, AL, which Southern Living recently named one of the best college towns in the South. Included among this year's record-setting enrollment of over 8,400 students was an incoming freshman class with both the highest average ACT score (27.6) and GPA (3.81) in the school's history. UAH offers nearly 90 degree programs of study at the undergraduate and graduate level, with colleges in the Arts, Humanities, & Social Sciences; Business Administration; Education; Engineering; Nursing; and Science. Class sizes are small, averaging just 27 students, while a faculty-to-student ratio of 1:17 ensures personalized attention and support. Outside of class, students have ample opportunity to conduct hands-on research at UAH's 16 high-tech labs and research centers or through internships and co-ops with area employers like the HudsonAlpha Institute for Biotechnology, NASA's Marshall Space Flight Center, and the National Weather Service. The university's 432-acre campus is home to more than 130 student-run organizations, 13 fraternities and sororities, and 18 NCAA sports -- including the only Division I ice hockey team in the Southeast. UAH is regularly ranked the best return on investment among all schools in Alabama, and has been named by the Brookings Institution as the best university in the state based on the economic outcomes of its graduates. UAH alumni typically go on to earn a higher average starting ($55,500) and mid-career ($94,000) salary than most of their peers across Alabama. Self-described as “The friendliest campus in the South,” Jacksonville State provides students with an intimate college experience. Home to over 7,000 undergraduate students, JSU believes in campus participation and has several student clubs and organizations, including frisbee, public speaking, and political groups. JSU offers a selection of men’s and women’s NCAA Division I sports, intramural sports, and fitness classes. The institution provides a public transit service to students known as the Gamecock Express. The cost for the service is included in tuition, and students can ride any route. With six colleges spanning the art and sciences, business, education, health sciences, human services, and science, students have many majors to choose from. Students can earn a bachelor’s degree in subjects like ceramics, electronics engineering, molecular biology, environmental chemistry, and broadcasting. Famous alumni include musician Randy Owen and the first deaf Miss America title holder, Heather Whitestone. One of the most unusual features at Birmingham Southern is the school’s exploration term, a mini-term between the fall and spring semesters. Students are given four weeks to delve into a subject of their choosing. This practice was devised to give students the chance to explore a subject in depth, either on- or off-campus . Students can also study abroad during the exploration term. The institution also follows an “exploration curriculum” designed to provide students with ample experience in problem solving, written and oral communication, critical thinking, and research. As one of the top liberal arts colleges in Alabama, BSC engages students in hands-on learning. BSC offers 50 academic programs. Undergraduates can major in subjects like art history, Asian studies, engineering, mathematics, media and film, music, and philosophy. The institution also offers several undergraduate minors like human rights and conflict studies, sociology, and physics. Spring Hill, located in Mobile, is the oldest college in Alabama and one of the 28 Jesuit colleges in the U.S. It was founded as a Catholic institution of higher learning. It’s a private school that focuses on academic excellence and a commitment to service in the community. The core curriculum requires students to complete courses in math, science, English, foreign language studies, theology, and philosophy. Spring Hill has a center in Italy where students can study abroad for a semester, a summer, or a full-year. Other study-abroad locations include the University of Limerick in Ireland, Universidad de Belgrano in Argentina, and Queen’s University in Belfast, Ireland. Spring Hill offers undergraduate majors , minors, and concentrations. Students can choose to attend classes during the daytime or evening. Popular programs include psychology, education, social sciences, and biomedical sciences. Famous alumni include chess player Paul Morphy, Former U.S. Secretary of Labor Alexis Herman, and journalist Colman McCarthy. Home of the Auburn Tigers, the school is one of the most well-known colleges in Alabama. Famous alumni include Apple CEO Tim Cook, all-star athlete Bo Jackson, and Carolina Panthers quarterback Cam Newton. The institution focuses on sustainability and offers 110 courses in the subject. Auburn prides itself on its diverse student population of nearly 30,000 and offers over 300 clubs and activities. Students can choose from 110 bachelor’s degrees through 11 colleges. Auburn has an agricultural focus and offers degrees in agricultural business and economics, agricultural communications, several specified agronomy and soils majors, horticulture, food science, and biosystems engineering. Auburn offers degrees in other fields including architecture, human resources, communications, education, and human sciences. Online programs are also available, including a master’s of business administration. Auburn’s 2016 acceptance rate was 77.7%. The campus includes all-gender restrooms, Greek life, student organizations, and more. North Alabama, located in Florence, is a vibrant, active college in Alabama. The historic city offers students an array of shops, restaurants, and activities. One of the more unique features of UNA are the institution’s mascots, two African lion siblings named Leo III and Una. UNA offers students many activities, from NCAA Division II sports to over 140 student organizations. Students can study abroad in Africa, Costa Rica, and France. Through four colleges, UNA offers students over 140 majors and concentrations . Students interested in foreign language studies can take French, German, or Spanish. Students can achieve bachelor’s degrees in areas like computer science, physics, music, elementary education, literature, and finance. Master’s programs are available in mental health counseling, exercise science, nursing, and more. Famous alumni include retired MLB left fielder Josh Willingham, 2002 Pulitzer Prize winner for editorial cartooning Clay Bennett, and author Jim Blasingame. Samford, located in Birmingham, is one of the best private colleges in Alabama. The university has a student-to-faculty ratio of 12:1. Undergraduates can choose from among 30 degree options and 158 areas of study. Bachelor’s degrees are available in majors like chemistry, athletic training, marketing, political science, print journalism, German, and teaching. As part of the core education in the liberal arts, students are expected to take classes in Biblical and cultural perspective, health and fitness, and communication. The school offers students the opportunity to participate in 17 sports: men’s and women’s basketball, golf, tennis, and track and field. Famous alumni include four Rhodes scholars, Emmy Award-winning actor Tony Hales, former U.S. Congressman Cordell Hull, author Jennifer Pharr Davis, and cornerback Cortland Finnegan. South Alabama combines innovation, collaboration, and research. Students studying medicine have access to training through the USA Health system . This comprehensive health system makes USA one of the best colleges in Alabama for students interested in the medical sciences. Located on 1,200 acres in Mobile, students have access to unique recreational opportunities like water sports, beaches, and Southern beach towns. South Alabama has sports clubs including Bass Fishing, Rock Climbing, Karate Club, and Cricket. Home to over 16,000 students, South Alabama offers over 100 majors through 10 colleges . USA has an early acceptance program for qualified high school students interested in the College of Medicine. Majors within this college include pediatrics, oncology, microbiology, pharmacology, familiy medicine, and psychiatry. The school has an honors and study abroad program. Mobile is one of many Christian colleges in Alabama. The university focuses on providing a Christian centered education that is student and academically focused. The campus sits on 880 acres and is just a mile from gulf beaches. The university is noted for having the best dorms in the state and is among the safest colleges in Alabama. Mobile has over 1400 students and offers sports programs, mission opportunities, and student organizations. A unique feature of the university is Focus Fridays , where students are encouraged to participate in community activities, creative interests, or volunteering. Undergraduate students can pursue a bachelor’s degree in one of six colleges . The largest is the College of Arts and Sciences, which offers degrees in English, communications, history, math, and psychology. As a Christian-based institution, Mobile offers two bachelor’s degrees in Christian studies: intercultural studies and theological studies. Athens helps traditional and nontraditional students achieve academic success through its day, night, and online course offerings. The small university accommodates approximately 3,000 students per year through its main campus in Athens and its six campus centers across northern Alabama. The institution, which opened its doors in 1822, is the oldest Alabama college in continuous operation. Athens has three colleges: arts and sciences, business, and education. Through these three colleges, students can pursue a bachelor’s degree in majors like accounting, art, behavioral science, early childhood education, history, and acquisition and contract management. Minors in nearly 50 subjects are also offered, including drama, health fitness, small business/entrepreneurship, and sociology. Famous alumni include author Chris Guillebeau, former MLB outfielder Gary Redus, and Alabama State Senator Bill Holtzclaw. Student services include counseling services, an accounting and statistics lab, and a writing center. Montevallo focuses on what they call “Unconventional Wisdom, ” or the idea that education takes place inside and outside the classroom. The school offers students a small, “honors college” feel at a public university price. The university grounds were originally designed by the Olmsted Brothers. The architecture firm was also responsible for the design of the Biltmore and Central Park in New York. Montevallo practices sustainability, with the Green Fund, Environmental Club, a community garden, and a bike-sharing program. Students pay $5 per regular semester and $2 per summer semester into the Green Fund. This allows learners to complete projects that promote sustainability around campus. The institution offers 16 Division II NCAA sports teams and a variety of student organizations. Intramural sports include flag football, ultimate frisbee, and basketball. Through four colleges, the University of Montevallo offers 38 programs and 75 majors. Students can earn a bachelor’s degree in the arts and sciences, business, education, and fine arts. West Alabama, located in Livingston Alabama, was originally founded as a church-based women’s college in 1835. Today, the institution serves West Alabama’s growing population and has opened its doors to both genders. UWA amenities include a fitness center, residence halls, and dining. Campus life is vibrant. UWA offers opportunities for students to get involved including academic organizations, club sports, honors clubs, and Greek life. The university also has a cinema on campus. Students seeking a bachelor’s degree can choose from over 50 majors and 36 minors. Majors include biology, athletic training, history, psychology, elementary education, finance, marketing, and nursing. Minors include journalism, art, English, exercise science, management, Spanish, and theater. West Alabama offers tech programs including automotive engineering tech, industrial maintenance, and emergency medical services. The school’s sports teams are in the NCAA Division 2. Oakwood is a historically black, Christian college located in Huntsville. The institution is private and owned by the Seventh-day Adventist Church. The university offers students a spirited, active campus life with several student organizations, spiritual life enrichment, sports, and the Healthy Campus 2020 initiative. This initiative is set up to encourage students to make healthy lifestyle choices. The Healthy Campus 2020 focuses on rest, nutrition, temperance, going outdoors, and physical activity. As a Seventh-day Adventist institution, Oakwood University is affiliated with 13 other colleges throughout the country. Students can pursue several majors, including programs in nutrition and health, religion, education, political science, biology, sciences, music, and math. Famous alumni include Chaplain of the U.S. Senate Barry Black, singer-songwriter Brian McKnight, former Mayor of Philadelphia John F. Street, and Little Richard. Troy, home of the Trojans, has a main campus located in Troy, Alabama. Originally an institution to train teachers, Troy University opened its doors as Troy State Normal School in 1887. The university has four state campuses, degrees available entirely online, and satellite campuses around the country. The institution’s football team is one of the most well-known in the country and a member of the NCAA Division 1. Troy is one of the best colleges in Alabama for veterans and their families. The institution offers additional benefits through the TROY for Troops program, where veterans and military-affiliated students receive the academic support and career services they need. Troy alumni include DeMarcus Ware, Al Lucas, and Jill Dobson. On its main campus, TROY offers over 80 undergraduate degrees and dual enrollment for high school students. Degrees include accounting, marketing, business management, computer science, education, music theory, journalism, biology, and criminal justice. Based in Montgomery, Faulkner University enrolls more than 3,200 students annually. The university's academic programs blend classroom study with community service and experiential learning. Available undergraduate programs include theatre, English, biblical studies, and criminal justice. The university also offers master's and doctoral programs, which students can customize through specializations and research and practicum experiences. Unlike other colleges in Alabama, Faulkner offers 23 online programs, including a fully-online master's of education with an emphasis on curriculum and instruction. Applicants must have an ACT or SAT score of 18 or 940, respectively. Faulkner offers affordable tuition rates, and students have opportunities to earn dean’s awards and transfer scholarships. The school provides individualized academic advising and career services. As a private, undergraduate women’s college, Judson’s mission is to prepare women for meaningful lives of purpose through a Christ-centered education. With a student-to-faculty ratio of 9:1, Judson provides students with personalized attention. It is one of the best colleges in Alabama for learners looking for a small-campus experience. The institution is located in the city of Marion. Students can participate in many extracurricular activities, including intramural sports, clubs and organizations, and the school’s Big and Little Sister mentorship program. Students pursue bachelor’s degrees in 20 majors from four different disciplines: humanities and fine arts, social sciences, sciences, and professional studies. Students can major in mathematics, English, nursing, religious studies, chemistry, criminal justice, and web design. Famous alumni include botanist Caroline Dormon, poet Billy Jean Young, writer Mary Ward Brown, and retired Alabama supreme court judge Janie Shores. Founded in 1867, Alabama State University in a historically black institution that focuses on providing academic opportunities for students from underserved communities. ASU offers undergraduate and graduate degrees in areas such as computer information systems, health information management, forensic science, and history. ASU is one of many schools in Alabama to offer education degrees. The university also offers a variety of distance education programs, including entirely online master's degrees. ASU students cultivate leadership skills and undertake professional experiences by engaging with organizations such as Advancing Minority Entrepreneurship and Science In Motion. Alabama residents pay discounted tuition rates, and students can apply for institutional scholarships and state grants. Established by Booker T. Washington in 1881, Tuskegee University is a historically black college in Alabama, and it was named a National Historic Site by Congress. The college is home of the Tuskegee Tigers, and the athletic department offers 12 sports, six each for men and women. It is one of two centers funded by NASA to develop the technology for creating space food for astronauts. The university is the largest producer of African-Americans graduating with a bachelor’s degree in science, math, and engineering in the state. The institution has eight colleges. And students can choose from many majors . Tuskegee is well-known for its College of Engineering, which offers seven concentrations: aerospace science engineering, military science, electrical engineering, chemical engineering, materials and science engineering, mechanical engineering, and aerospace studies. Famous alumni include singer-songwriter Lionel Richie, actor Keenan Ivory Wayans, Super Soaker inventor Lonnie Johnson, and Olympic gold medalist Alice Coachman. Amridge, located in Montgomery, was one of the first colleges in Alabama to focus on online learning. It’s a private, nondenominational, Christian college that offers affordable, accessible higher education. Amridge is ranked among the top colleges for veteran friendly services, offering the support and guidance veterans need to complete their degree. The institution offers the Yellow Ribbon Program and Scholarship for veterans. All veterans eligible for this program are given a scholarship along with their VA funds. It covers all tuition and fee expenses that are not covered by their Chapter 33 benefits. Students have full access to books and research materials through the library located on campus in Montgomery. Amridge offers undergraduate studies in majors like criminal justice, human resources, management, human development, Biblical studies, and ministry studies. Associate, master’s, and doctorate programs are also available. Amridge hosts a prayers breakfast every quarter in downtown Montgomery. It’s streamed online for distance learners. Established in 1967, Auburn University at Montgomery is nationally recognized as one of the top colleges in Alabama and offers more than 90 academic programs through five colleges. Undergraduate programs include biology, communication disorders, kinesiology, and homeland security and emergency management. The university offers graduate programs in areas such as public administration, information systems management, psychology, and liberal arts. Auburn maintains a comprehensive list of education degrees, many of which are available in an online format. Other available distance education programs include degrees in nursing and public policy. Auburn students have access to service learning and leadership programs such as honor societies, Greek organizations, and the Global Education Center. Alabama residents and online students pay discounted tuition rates. Huntingdon, located in Montgomery, places value on three traditions: faith, wisdom, and service. Huntingdon’s educational approach is centered around the institution’s motto, “Enter to grow in wisdom, go forth to apply wisdom in service.” This liberal arts college focuses on an education that provides students with learning opportunities inside and outside the classroom through mentorship, service learning, and exploration through travel; this is known as the Huntingdon Plan . Most fees for travel are covered through regular tuition rates. Undergraduate majors include accounting, elementary education, music, physical therapy, veterinary medicine, religion, and psychology. Students seeking a degree in the medical field have several tracks to choose from including pharmacology, physical therapy, and optometry. Famous alumni include author Kathryn Tucker Windham, golfer Joe Durant, retired U.S. Navy Admiral Elizabeth Hight, and novelist Harper Lee. Founded in Tuscaloosa in 1876, Stillman College primarily offers bachelor of arts and bachelor of science degrees. Available majors include history, religious studies, psychology, and criminal justice. Like many other schools in Alabama, Stillman offers comprehensive degree options in the education field, including programs in K–12, special education, and physical education. High-achieving students can join the Harte Honors College, which replaces general education requirements with interdisciplinary seminars emphasizing critical analysis and independent research to prepare students for master’s and doctoral programs. Stillman offers many classes asynchronously, enabling students to earn degrees through a hybrid format. All students pay the same affordable tuition rate. Talladega College was founded in 1865 as a school for the children of former slaves. Today, Talladega is a fully-accredited liberal arts institution that offers accessible undergraduate programs. The college offers BA programs in areas such as computer information sciences, business administration, mass media studies, and music performance. Talladega also offers an education program that leads to state teacher certification. Many courses are available as night classes or online; students can pursue degrees in a hybrid format. Unique among colleges in Alabama is Talladega's FASTtrack program in organizational management, which is designed for working professionals who want to complete their bachelor’s degree. Applicants must have a minimum 2.0 GPA and submit ACT or SAT scores. All Talladega students pay the same affordable tuition rate, regardless of residency. Academic scholarships and grants are available. In recent years, the Alabama Board of Education has placed greater emphasis on two-year educational programs in order to grow their skilled workforce. Over 459,000 Alabama residents are reportedly underemployed, meaning their occupation does not require a college degree. However, Alabama has a great demand for middle-skill workers, with over 70% of current job openings categorized as middle-skill positions. Two-year programs play an important role in filling this gap between underemployed and middle-skill workers, providing higher education for students at more affordable rates and focusing on vocational skills. These institutions prepare potential undergraduates for traditional four-year degrees, or they teach applicable and in-demand tradeskills. While Alabama's manufacturing and industrial fields provide solid employment opportunities for less educated citizens, the reality is that a higher level of education means substantially better wages in all fields of employment. The surplus of available jobs requiring tradeskills combined with the government's recent emphasis on bridging the skills and education gap in the workforce means now is a great time to consider a two-year educational program. We have ranked the best two-year schools in the following list. Reid State Technical College is a two-year institution located in Evergreen, Alabama. Part of the Alabama Community College System, the school was established by the Alabama State Legislature through a state statute in 1963. The school’s main campus—26 acres surrounded by rural scenery—was donated by the City of Evergreen. One of the best community colleges in Alabama, RSTC offers a dozen areas of study, including commercial truck driving, computer information systems, cosmetology, cosmetology instructor training, early child care education, electronics, health careers, human services, industrial maintenance, nail technology, office administration, and welding technology. In addition, the college offers a GED completion program, dual enrollment for high school students who want to get a jump start on their college experience, and Ready to Work Training, which is an industry training program for unemployed and underemployed residents of Alabama. RTSC is accredited by the Accrediting Commission of the Council on Occupational Education. Shelton State Community College is located in Tuscaloosa, Alabama. It was established by a resolution of the Alabama State Board of Education in 1979 that combined Shelton State Technical College with the Tuscaloosa branch of Brewer State Junior College. In 1994, SSCC consolidated with another public two-year college in Tuscaloosa, C. A. Fredd State Technical College. As one of the largest and best community colleges in Alabama, SSCC offers two-year associate of arts and associate of science degrees in a variety of areas. The college also offers associate of applied science degrees through its technical division in several fields. Tuscaloosa is a particularly popular city among students. The city is home to three colleges, including the state’s flagship public university, the University of Alabama, making the city the state’s de facto college town and facilitating an easy transfer from SSCC to the University of Alabama. Coastal Alabama Community College formed in 2016 as a result of the consolidation of three storied institutions: Jefferson Davis Community College, Alabama Southern Community College, and James H. Faulkner State Community College. The resulting institution is one of the very best community colleges in Alabama. Accredited by the Southern Association of Colleges and Schools Commission on Colleges, CACC has fifteen locations along the Gulf of Mexico. The school features on-campus housing at Sun Chief Hall and Thompson Hall, both located at the CACC Bay Minette Campus. CACC offers associate of science and associate of arts transfer degrees, as well as associate of applied science degrees and certificate programs. Some of the school’s more unique degree programs include agribusiness economics, surveying and geomatics, applied science degrees in animation, video graphics and visual effects, landscape and turf operations management, and paper and chemical technology. Located in Andalusia, Alabama, Lurleen B. Wallace Community College was formed in 2003 after Lurleen B. Wallace Junior College merged with the MacArthur State Technical College. The school’s namesake, Lurleen B. Wallace, served as state governor from 1967 to 1968. Wallace remains Alabama’s only female governor to date and is a cultural icon throughout the state. As one of the best Alabama community colleges, LBWCC offers numerous two-year degree and certificate programs. Students can earn two-year degrees from the college’s Academic Division on subjects such as accounting, business, economics, information technology, and child development. From the college’s Career/Technical Division, students can earn a degree or certificate on topics including automotive mechanics, computer science, cosmetology, and diesel and heavy duty equipment. The school offers fully-furnished student housing at Saints Hall, a facility conveniently located within walking distance of the Andalusia Campus. The student apartment complex is is owned and operated by the LBWCC Foundation. Founded in 1966, Trenholm State Community College operates two campuses in the River Region of Alabama, its Patterson Campus and its Trenholm Campus. The school’s location within the River Region (also known as the Montgomery metropolitan area) offers students the convenience of Southern city infrastructure with the affordability and practicality of a modern community college. TSCC is one of the best community colleges in Alabama. The school offers an associate of arts through its liberal arts degree program and an associate of science via its general education degree program. Students who enroll in these programs usually transfer to a four-year institution to complete bachelor’s degrees in a variety of programs, including art, education, health, physical education, or music. The school’s many technical program offerings include automotive technology, automotive collision repair, diesel mechanics, truck driver training, accounting technology, and child and human development. TSCC also offers many two-year health programs in fields such as dental assisting technology, diagnostic medical sonography, and emergency medical services. Located in Rainsville, Alabama, Northeast Alabama Community College is a two-year institution accredited by the Southern Association of Colleges and Schools Commission on Colleges. One of the best Alabama community colleges, NACC offers a large variety of associate degree programs for students who wish to transfer to four-year schools and complete their bachelor’s degrees. The school also offers a number of associate in applied science degree programs for students interested in career and technical programs. Career and technical program offerings include business management and supervision, child development, computer information systems, criminal justice, drafting and design technology, emergency medical services, engineering technician, nursing, and salon and spa management. NACC also offers numerous certificate programs. NACC’s attractive campus is lined with courtyards and flower gardens, and features a nature trail around a four-acre lake. Students have many campus involvement opportunities at the school, including intramural sports, student government, and a variety of clubs and organizations. Bevill State Community College has four campuses located in Sumiton, Jasper, Hamilton, and Fayette/Pickens. The college’s service area spans seven counties -- from Birmingham to Mississippi. BSCC was created in 1992 as the result of a consolidation of two-year colleges Walker State Technical College and Brewer State Junior College. One of the best Alabama community colleges, Bevill State offers associate degree transfer programs, career and technical training programs that lead to Associate in Applied Science degrees, certificates, and programs in healthcare. BSCC’s offers an array of transfer programs, including accountancy, business, criminal justice, education, and general studies. The school’s career and technical training programs include such diverse offerings as HVAC/R, automated manufacturing technology, business office management, and spa management. BSCC offers health care programs in fields like nursing, surgical technology, sterile instrument technician, mental health qualified tech, phlebotomy, and emergency medical services. Wallace State Community College, located in Dothan, Alabama, is one of the best two-year colleges in Alabama. Dothan, a rural community located in the far southeast of the state, is within close proximity to both the Georgia and Florida borders, and WS students enjoy quick drives to beaches along the Gulf of Mexico. WSCC offers a number of associate degree programs in arts and in science that may be completed upon transferring to a four-year baccalaureate degree program. These programs are available through six academic divisions: developmental studies; English communications; fine arts; humanities, social, and behavioral sciences; mathematics and computer science; and natural sciences. WSCC also offers a variety of two-year career and technical education programs including HVAC/R, applied engineering technology, automotive technology, business technologies, and cabinetmaking. WSCC is a recognized leader in faculty innovation: the school was a 2015 National Bellwether Finalist and a 2016 finalist in the American Association of Community Colleges’ Awards of Excellence. Located in the small town of Hanceville, Alabama, Wallace State Community College was established in 1963 and offered its first classes in 1966. The college celebrated its 50th anniversary in 2016. WSCC serves five counties in north-central Alabama: Cullman, Blount, Winston, Morgan, and Jefferson. The school is the third-largest community college in the state and is also Alabama’s largest single-campus two-year institution. Notably, Wallace State’s student-completion rate is the highest in the Alabama Community College System. 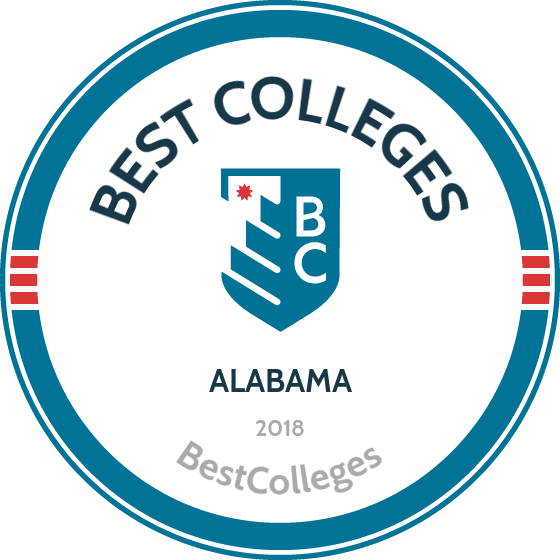 As one of the best two-year colleges in Alabama, WSCC offers associate degrees of arts, science, and applied science as well as a variety of certificates. Its academic division, home to its transfer programs, includes art, business, criminal justice, computer science, liberal arts, paralegal studies, and sports medicine programs. The school’s technical division features a large offering of associate of applied science degree programs and certificates. Two of WSCC’s more unique offerings are agricultural production and aviation/flight technology. With more than 19 health science programs, WSCC is also the largest health science provider in the Alabama Community College System. Gadsden State Community College is a two-year college in Gadsden, Alabama. GSCC was formed in 1992, a result of the consolidation of Walker State Technical College and Brewer State Junior College. In 1993, GSCC absorbed Northwest Alabama Community College’s Hamilton campus, and in 1998, the school consolidated UAB/Walker College, an academic transfer college. Today GSCC has four primary campuses, providing students with the optimal facilities and maximum flexibility. As one of the best community colleges in Alabama, Gadsden State offers a significant variety of two-year degree programs, including associate degrees in applied science, science, and the arts. Its technical program offerings include auto collision repair, carpentry, and cosmetology, for example. GSCC is accredited by the Southern Association of Colleges and Schools Commission on Colleges. Fowler Hall, located on the Wallace Drive campus, is the college’s on-campus residence hall and features semi-private suites with baths. Apartments and other housing are also available near campus. Lawson State Community College is one of the country’s Historically Black Colleges and Universities. As one of the best community colleges in Alabama, Lawson State offers transfer degree programs, career/technical training, and healthcare programs. LSCC’s primary campus stands just outside of Birmingham, the most populous city in the state and once a major industrial center for the United States. The school’s proximity to a large city provides students with a plethora of housing options, as well as the convenience and opportunities that come along with large city life. The city the city enjoys a vibrant and diverse culture, and is home to several other educational institutions. In 2011, LSCC was recognized by the White House as a Champion of Change. And in 2015, the school was selected to host a visit by President Barack Obama. LSCC has yet another notable connection to the White House by way of a notable alumnus, Lt. Colonel Leernest Ruffin, former Command Operations Officer and Presidential Communications Officer for the White House Communications Agency. Located in Huntsville, Alabama, J.F. Drake State Community and Technical College was founded in 1961 to provide career training opportunities to African Americans in the surrounding communities. Today, Drake State continues its mission of accessible education, offering certificate and associate degree programs in a variety of growing fields, including health services technologies, developmental education, and computer science. Many of Drake State’s programs develop applied skills that prepare students to secure jobs immediately after graduation. Through its Workforce Development Division, the college also offers professional development courses, many of which can be accessed online in an asynchronous format. Like other community colleges in Alabama, Drake State requires applicants to have their high school diploma or equivalent. Three academic semesters are offered each year and students are admitted on a first-come, first-served basis. Tuition is assessed based on residency status, and scholarships are available based on academic achievement. Snead State Community College is located in Boaz, Alabama. The school originated as Boaz Seminary in 1898 and is the oldest community college in the state to award associate degrees. As one of the best community colleges in Alabama, SSCC also features on-campus housing and offers students all the benefits of Southern small town life. Boaz is a quiet city in the northeast corner of the state, located among the low rolling hills of the southern Appalachian mountains. The city is built on a sandstone plateau, Sand Mountain, and, as a result, Boaz enjoys one of the coolest climates in the state. SSCC offers associate in science degree programs in subjects such as apparel and textiles, business, business education, health information management, health sciences, and health services administration. The school also offers associate in applied science degree programs in business, computer science, technology, and child development. SSCC additionally offers certificate programs that can be completed in about one year. Certificate programs are available in, for example, child development, and nursing. Wallace Community College Selma originated in 1963 as the Rufus King State Vocational Technical School. King was a former U.S. senator and vice president under Franklin Pierce and George Wallace was the state’s 45th governor, husband of Lurleen B. Wallace. WCCS, one of the best two-year colleges in Alabama, offers associate degrees in both arts and science, and transfer programs in biology, chemistry, criminal justice, English, health, history, and many more. The college also offers technical programs in 16 areas, including auto body repair, HVAC/R, auto mechanics, and cosmetology, as well as associate in applied science degrees in business administration, computer information systems, and criminal justice. In 2007, WCCS partnered with the Bill and Melinda Gates Foundation, the Selma City School System, and SECME, a pre-college STEM education program, to house the first and only Early College Program in the state. Calhoun Community College is Alabama’s largest two-year college and the sixth largest institution of higher education in the state of Alabama. Located among four counties at the Alabama-Tennessee border, CCC serves students at three locations: beyond its primary, 110-acre campus in Decatur, the school conducts class and offers resources at its Huntsville/Cummings Research Park location and its Limestone Correctional Facility site. CCC offers students a plethora of programs to choose from, equaling a total of 49 associate degree programs and 52 career/certificate programs. One of the best community colleges in Alabama, CCC offers both associate of science transfer degrees and associate of applied science degrees. The college’s renewable energy associate degree program is the state’s first and only such program. Housed at the Alabama Center for Excellence in Clean Energy Technology, the program is funded through a $3.47 million U.S. Department of Labor grant. Jorge Posada, a Major League baseball player who plays for the New York Yankees, is a notable alumnus of the school. Located in the storied port city of Mobile, Alabama, Bishop State Community College is a state-supported, open-admission two-year school. A historically black college, BSCC originated as the Mobile branch of Alabama State College, which offered extension courses to black teachers in the city. Today, BSCC operates four locations and serves residents throughout Mobile and Washington counties. As one of the best Alabama community colleges, BSCC offers both transfer degree programs and technical/workforce development programs. Its academic programs include fields such as the social sciences, business and economics, education, health fields, and natural sciences. On the technical programming side, BSCC offers training in business and industry, computer information systems, consumer and transportation technology, commercial and industry technology, engineering and construction, and welding technology. Designed to produce remedial proficiency in English, mathematics, and reading, the school readies underprepared students with its developmental education program. Operating across several campuses and based in the small town of Wadley, Alabama, Southern Union State Community College serves residents in eight counties throughout east Alabama, central Alabama, and neighboring western Georgia counties. As one of the best community colleges in Alabama, SUSCC offers its students a variety of transfer academic programs, technical and workforce development programs for specialized careers, and health sciences programs for specialized training in the health field. The college’s Technical Education and Workforce Development Division offers associate degree programs in applied science as well as programs in occupational technology. SUSCC also offers certificate programs, including a six-week, intensive, 240-contact-hour tractor-trailer truck driver training course for students interested in professional careers that require a commercial driver’s license. Notable alumni include Taylor Hicks, 2006 American Idol winner, Stephen Boss, professional dancer and recent runner-up on the Fox TV show So You Think You Can Dance, and Brad Cotter, 2005 winner of USA Network’s TV show Nashville Star. Chattahoochee Valley Community College offers an array of certificate and associate degree programs. Associate degrees are divided into career tracks for students who want to enter the workforce after graduation, or into "university parallel" pathways for learners who want to enroll in a four-year college or university. Program areas include applied technology, criminal justice, and nursing. CVCC students can pursue their coursework on campus in Phenix City, Alabama, or through an asynchronous online delivery method facilitated by Blackboard. Additionally, high school students have access to dual enrollment opportunities. Like other schools in Alabama, CVCC requires candidates to complete an online application, submit academic credentials, and participate in an academic assessment session. The school offers low tuition rates to all learners, who can also apply for financial aid. Scholarships are available for students who graduated from high school in Alabama. Students can pursue professional development opportunities by joining campus organizations such as Phi Theta Kappa, the international honors society for two-year colleges. Based in Enterprise, Alabama, Enterprise State Community College draws from a long history of community interconnectivity. ESCC was one of the first twelve junior colleges in Alabama, a result of both public and private donations from state citizens. ESCC is perhaps best known for its career programs in aviation. With programs on airframe technology, composite materials, maintenance foundations, avionics technology, and general aviation technology, ESCC’s Albertville campus is located at the Albertville Airport and the Andalusia campus is located at the Alabama Aviation Center. As one of the best community colleges in Alabama, ESCC offers a rich student life experience with plenty of activities and clubs to choose from, including a debate club, choir, intramural sports, and political clubs. ESCC’s mascot is the boll weevil, an insect that decimated the monocrop culture of much of the South and, in turn, pushed Southern farmers to diversify their crops. This shift ultimately yielded higher profits and allowed for greater flexibility in the event of future crop problems. The city of Enterprise features a unique monument to the insect. Remington College’s Mobile, Alabama campus first opened its doors in 1986. Since then, the school has gained a reputation as one of the best two-year colleges in Alabama. RCMC offers associate degrees in computer and network administration, criminal justice, medical assisting, pharmacy technician, and process technology. The college also offers technical training diploma programs in, for example, computer-aided design and drafting (CADD), cosmetology, and medical billing and coding. RCMC receives regular feedback from its Program Advisory Committee, which includes representatives of the local business community. This committee reviews and assesses the college’s programs, learning resources, facilities, and equipment to ensure the campus is meeting the educational and career/staffing needs of the Mobile community. Students can expect to receive one-on-one attention throughout their education at RCMC. RCMC is accredited by the Accrediting Commission of Career Schools and Colleges. If you're thinking about applying to one of the best colleges in Alabama, continuing reading to learn more about living in the Yellowhammer State. Located in the southern corner of the United States, Alabama covers 52,419 square miles and is rich with history and culture. The state contains a diverse selection of climates and terrains, from the southern sandy beaches along the gulf of Mexico to the Appalachian Mountain Range located in the northeast. With over 65% of the state's terrain considered forest, Alabama has plenty to offer in terms of National Parks and natural reserves. Alabama is also home to some of the most fervent college football fan in the country, putting it high on the destination list for sports fanatics. Living in Alabama can pad your savings account, as the cost of living is about 12% lower than the national average. However, low cost of living generally means lower wages and salaries, and Alabama has the 42nd lowest per capita income in the country. But the diverse lifestyles, urban, rural and plenty in between, means there is something for everyone in Alabama. Once you have decided Alabama is the ideal place to continue your education, your next step should be to consider establishing residency. This is always an important decision when preparing to enroll in college, as tuition costs for in-state students are substantially lower. As with other states, the process for obtaining residency in Alabama depends on various factors. In Alabama, persons under the age of 19 are considered minors, rather than 18, as is customary in most states. Residency status for minor students is determined by the residence of a student's 'supporting person.' If you don't have a parent or guardian living in Alabama, it will be very difficult to obtain residency as a minor. If you are over the age of 18 you may be able to qualify for residency status, but it is not a simple task in Alabama. You do not become a resident simply by living in Alabama for 12 or more months as a student, and you will not be eligible for residency if you moved to Alabama with education as your primary purpose. Residency for tuition purposes in Alabama is based almost entirely on whether or not your permanent domicile is in-state and being a student does not count as being a resident. If you are under 24 and do not have a parent or guardian living in Alabama, you will most likely be unable to receive residency.